The Sugar Hill Community Resort combines private resort living with the convenience of retail access. You can visit the resort clubhouse, fitness center, swimming pool, and tennis courts, or you can sit by the private plunge pool while sipping on a fruity cocktail. Sugar Hill’s Summer House can easily accommodate a small family or several couples looking to escape into their own personal paradise. The Summer House is part of the Sugar Hill Community Resort in St. James. 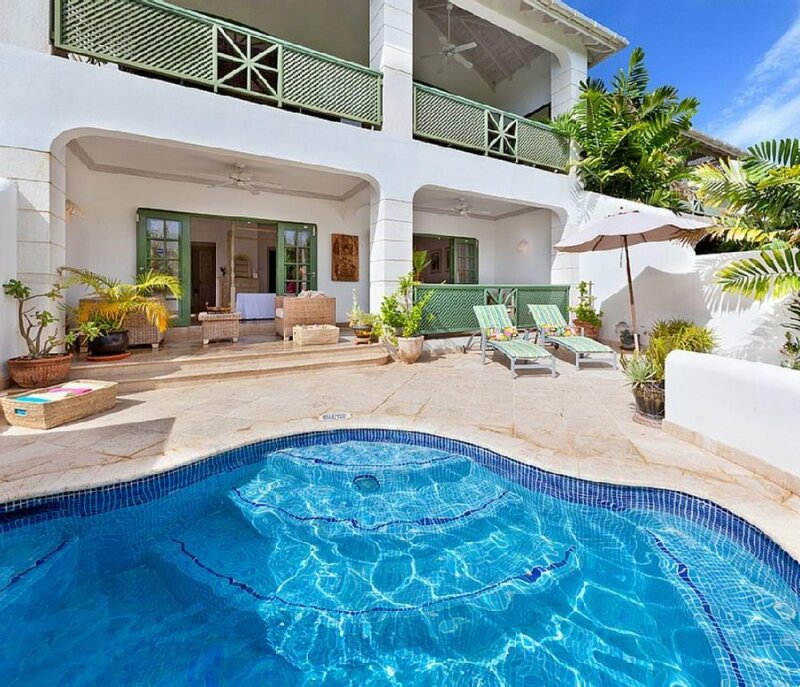 With four air-conditioned bedrooms and housekeeping six days a week, this plantation-style villa is perfect for families. Sugar Hill’s on-site facilities include an open-plan clubhouse with a restaurant and bar, four tennis courts with flood lighting, an air-conditioned gym, a 2,000 sq ft swimming pool, and a members’ lounge. Guests at The Summer House can enjoy beautiful sunsets while sipping cocktails around the plunge pool, or lounge on one of the numerous balconies around the villa. There’s al fresco dining on the balcony, and thick gardens surround the property. The living and dining area features travertine tile floors and a chic, muted color scheme. The kitchen is fully equipped with stainless steel appliances, a blender, a coffeemaker, and granite countertops. This property has four bedrooms with ensuite bathrooms: three are in the main house and one is in a separate cottage. The main house has a queen suite, a king suite, and a twin suite. The cottage suite is in the garden, and has its own mini fridge, microwave, ensuite bathroom, and two twin beds. A stay at The Summer House provides membership at the Fairmont Royal Pavilion Beach Club and access to water sports, beach restaurants, and beach bar service. Sugar Hill is also near Holetown’s banks, shops, and restaurants.